Women dominate in the senior living workforce. Four out of five professionals who care for seniors are women—and women don’t just work in senior living: They lead. 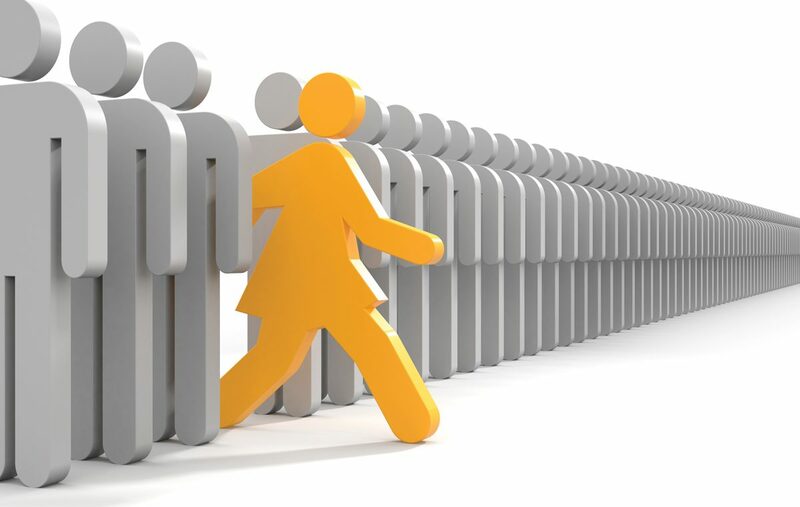 Unlike in the general business world, where the glass ceiling is still very much intact, women hold nearly 70 percent of senior living management jobs. Last fall Argentum launched a new initiative celebrating the contributions women have made to the growth and health of the industry. We continue that celebration with profiles of seven women who have championed senior living. No industry is perfect, of course, but for these women, senior living has proven a welcoming environment. Their combined successes demonstrate the boundless professional possibilities open to women who may be seeking to make a difference in the lives of seniors. 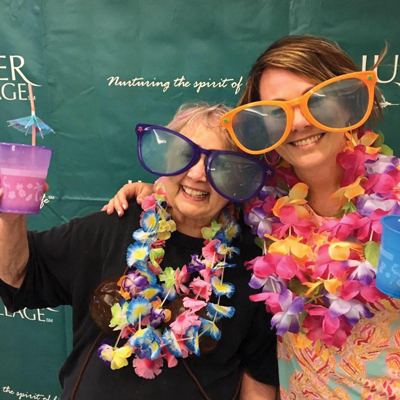 Anne Campbell (R) and coworker Finch VanDivier celebrate Juniper Anniversary Week with margaritas and a photo booth. Anne Campbell is between titles at the moment. She’s still employed with Juniper Communities: They just haven’t come up with a name for what she does there. “I’m working with our president Lynne Katzmann on the further development of our integrated care model. That’s a high-touch, technological approach, using electronic health records and a position we call the ‘medical concierge’ as a way to improve folks’ outcomes. We have some exciting results with that and we are looking at expanding that,” she said. Campbell started out in senior housing 13 years ago, having first gone to school for social work and then working on aging issues within social service agencies. She did a stint as a stay-at-home mom before finding her way into her first senior housing role, as an executive director in a Brookline memory care community. “When it was time to go back to work, I saw an ad in the paper and I said: I can do that! I had worked with individuals with dementia and that was my favorite population to work with. I felt that I could really deliver good care by listening to them and by learning more about them. This is a population that can easily be underserved, and I felt passionately about providing a high level of service to this very vulnerable population,” she said. When Juniper bought Brookline, she saw an opportunity to kick her career into high gear. Lisa Fordyce’s early resume didn’t have “future executive” written all over it. She went to vocational school to learn to be a caregiver. She married young, at age 19, and took a nursing job in a skilled nursing community, doing shift work while she studied for her boards. If she’s been able to parlay that modest beginning into a lifelong career, it’s largely because of the underlying passion that first propelled her into senior care. It took a little while for that initial impulse to form itself into a career ambition. Fordyce says she got a lot of support and guidance from supervisors who appreciated her potential. She climbed the ladder, taking regional and then national leadership roles. She earned her stripes as a leader who would stay in for the long haul: Seven years at ARV Assisted Living (now known as Atria Senior Living), almost 10 years at Emeritus. Along the way she augmented her caregiving skills with a deeper understanding of operations. Despite her steady rise, she encountered bumps along the road. She left her last job in order to be at home with her ailing grandmother. It required a literal leap of faith in order to put career aside temporarily, but she felt she owed it to her grandmother. “I’m a religious person and I turned it over to God saying, whatever will be will be. I knew I had created value and been a loyal employee and I just had to trust that everything would come together the way it was supposed to,” she said. When she was ready to return, her old contacts greeted her with open arms. “I had had a relationship with the OnShift team for about eight years, and when they reached out to me the timing was great. I was ready to learn something new and they saw it as a great opportunity for their company,” she said. For over a decade Mercedes Kerr has worked her way up the ladder with Welltower, a massive publicly-held firm with an ownership stake in diverse senior living, health care, and real estate enterprises. In 2016 she joined the firm’s senior management team. Even as she has thrived in that role, Kerr has wrangled with what she calls the “age-old challenge,” balancing her career against the demands of domesticity, including a husband and two teenaged daughters. Focus is key, given the complex demands of the job. Welltower has a broad portfolio encompassing not just senior living but also post-acute and outpatient facilities and various real estate holdings. That broad base of experience has been a boon to Kerr, who has leveraged her experience to benefit a range of enterprises.